Appendix I: Who Should Be Provincial Governors? Selected Works of Mahatma Gandhi comprises of Five volumes. This book, Selected Letters, is volume-4. This volume contains selected letters written by Mahatma Gandhi from time to time. Very few of these letters were published in Gandhiji's own lifetime. After his passing away, systematic efforts were made to collect numerous letters written by him to many friends and co-workers. We have tried to select and classify under different heads significant thoughts contained in these letters. In the first part of the Volume, we have included about a hundred letters in their complete form. Most of these letters were written on memorable occasions. I am sure the reader would be able to get an insight into Gandhiji's rich and varied personality through these letters. 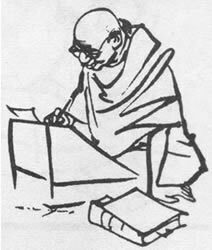 The second part contains Gandhiji's ideas which have been lifted from a large number of letters written by Gandhiji to many of his co-workers as well as men of public importance. Most of these ideas are of universal significance and would, I am sure, interest our readers in different parts of the world. A deluxe edition of Selected Works of Mahatma Gandhi was released in 1969. It went out of print in about six months. To meet the popular demand for it and to make it available to individual readers at a reasonable price a new soft-cover edition was soon released. It, too, was enthusiastically received and the entire stock of the publication was sold out in less than three years. We are very happy to say that the set was reprinted and was offered at a subsidised price to commemorate the Diamond Jubilee year of Navajivan Trust during 1993-94. Looking to its continuous demand and so also to fulfill Navajivan's object of propagating Gandhian Literature, its fifth reprint is being published with new type-setting in five volumes. We are sure, this new revised edition, too, would be well-received by individual readers, in order to enrich their personal library.